Snyder, John P. (1987). 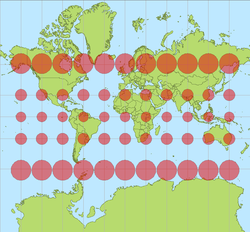 Map Projections - A Working Manual. U.S. Geological Survey Professional Paper 1395. United States Government Printing Office, Washington, D.C. Ovaj se članak može skinuti sa stranica USGS-a. Monmonier, Mark (2004). Rhumb Lines and Map Wars. Chicago: The University of Chicago Press. Ova stranica je zadnji put izmijenjena 05:40, 24 juni 2014.